As children, we all had hobbies that we loved talking about. Collecting stamps, coins, chocolate wrappers or bus tickets, painting, sketching and what not! We would be so proud to show it off to our friends and relatives. But as we grew older, most of us forgot about them too. When was the last time you did it or started something new as a hobby? 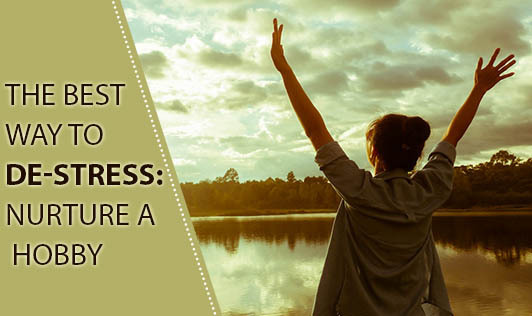 In our busy routine, we have almost forgotten about deriving happiness from these small things which is also the best way to de-stress. For most of us, nurturing a hobby would be an added work to our hectic schedule but little do we know that it has lifelong advantages. If you are wondering how to find a hobby that's suitable for you, just think about what you enjoy doing. It might be cooking, painting, sketching, writing short stories or poems or designing jewels. Pick up your camera and head out to explore your neighborhood or the city you live in. Click pictures on your way. You might end up finding a good photographer in you. Try learning a different language. If you are still not able to figure it out, just be impulsive and pick up some activity that might sound interesting to you and try your hand at it. Hobbies are fun and can uncover and nurture talents you didn't even know you had. They help you bring back balance into your life especially if you are a person who has made your career the most important objective in life. It's most advantageous for a career-oriented person who has strained relationships with his/ her spouse and family and may not have any real friends to speak to outside of their work atmosphere. Hobbies can open up a new world of socializing. Many mental health professionals encourage hobbies as a way to help people manage their stress levels. When your mind is fully engaged in your hobby, the trials and tribulations of life will take a backseat for a while. By the time you return to your life, all those problems and challenges may not even seem so overwhelming, and you find that you can handle them more effectively. People who have cultivated hobbies and nurtured it with time are known to bring out the best in them. It's time for you to try it.